Since giving up Facebook games, I've been reading again. It's so old-fashioned, it's such fun. I mean, I always read, but lately it's been just at bedtime, to make my brain stop whizzing and sleep. Now I'm reading in the morning, reading in the afternoon, reading in cafes. Outrageous! Last Thursday and Friday I inhaled The Hare with Amber Eyes, which was gorgeous. Simply gorgeous. I wish I could see ALL the netsuke, but by the look of teh interwebs, so does everyone. On Sunday I pretty much inhaled the whole of Wendy James' new novel The Mistake. It's a corker, a wonderful piece of suspense suspended in a very contemporary setting. It's a moral conundrum, and just as you think you've worked out what you think, it takes you right to the end and completely upends you. Highly recommended. I also read Jane Austen's unpublished novel Lady Susan, which was completely not what I expected it to be. In Melbourne I only had the braincells to read 3 books by Donna Leon, of whom I went through a phase many years ago, but it is either testament to my awful memory or the same-iness of her writing that I had already read two of the three and didn't realise it. I don't read or watch crime fiction by choice, but I can handle DL because her books are more about food, politics and Venice more than the actual crime, which often gets solved almost as an afterthought. 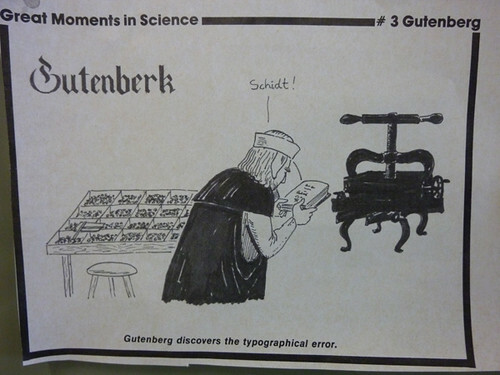 I read Alan Loney's short book, Anne of the Iron Door, which is about Gutenberg, and is very sad. His life was very sad generally, but Alan has made the story more about Anne, and her (imagined) life is awful. Beautifully written, though. I'm now reading Autumn Laing, lent to me by my mother-in-law, and apparently based on Sunday Reed. When I only have a moment, I dip into Hark! A Vagrant! the book, which just gets better and better with rereading. I think I've linked to these before, but I can't find where so I'm going to link again. OMG, I have to stop, but I can't stop, Kate Beaton's comics are SO GOOD, and all about literature and history, so they are good for you. Time to go to bed and read. My fingertips are aching from ukulele group tonight, and the keyboard is just making it worse. Good night! Back to school, and gawd it's nearly March. Who'd have thunk it? I suppose you noticed how I dropped the word 'girlfriend' into that last post. Of course you did, I wrote it in all caps, which meant I really shouted it at you. LIKE THIS. I hoped, hoped, hoped that B would have a smooth transition to his new school. 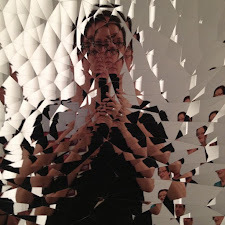 I myself went to a lot of schools, and quite enjoy that chance to reinvent oneself that change brings. I wasn't sure how he would go, although the back of my mind was quietly confident, because he's a lot like me, and we just bounce into places like puppies and try our best to be loved. He'd had a period at his primary school where one of the 'cool' boys decided he wasn't worth knowing (he probably did one stoopid little thing, none of us can remember what) and caused a ripple effect of ostracism, not for weeks or months, but for years, in the case of two or three boys. It got to the point where even those who started it couldn't remember how it started, but it carried on in a vague way through to high school, and B never really had a 'best' friend because of it, although he always had lots of people who liked him. Moving schools locally has meant that he's kept the friends he really likes and had a chance to go somewhere where that little hum of something was unknown. And it's worked. He comes home bouncing every day, in love with everything, and getting more and more involved in the community of the school. 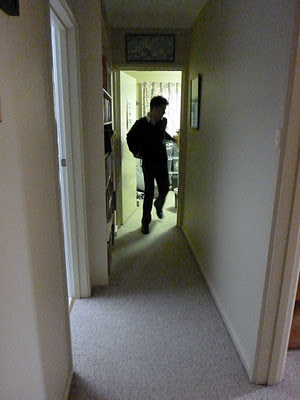 This photo was taken about nine months ago, but this is what he looks like most days, instead of only some days. Gorgeous, no? And happy. His girlfriend (E) and her friends seem to be creative, fun people. They persuaded him to join the school choir with them audition for the school play with them, and then on Thursday lunchtimes they have their own writing group. So he's writing and enjoying it. Wow! 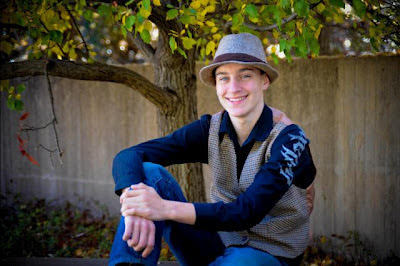 My next big hope is that E treasures his kind, eager-to-adore heart and doesn't use it up and spit it out. That if they break up, it happens kindly and they stay friends, or that he can at least stay friends with her friends. It's only a hope, I have no influence in any of this, and of course he's going to have heartbreaks in life, so I just put it out there to the universe: be kind, please. It's the best I can do. I left you hanging there, didn't I? You know, we worked so hard last week, and everyone achieved what we set out to do: print an edition of letterpress poetry broadsides in essentially 4 days. I was so happy on Friday night, and then started fading on Saturday. By Sunday I was home and transformed into a floppy pile of lacklustre. I managed to drag myself to a movie, purely to chaperone Bumblebee and his new GIRLFRIEND, and I also managed to mostly get myself together to prepare for my first uni class of the year, but it was all like swimming in porridge. Today, I am much better. I had my second class of the year, because YAY, my typography course is running! Tomorrow, with a sleep-in, I'll be tip top. The Rare Book Summer School class was a wonderful experience, predominantly because it was full of people who knew enough to be able to contribute to the week in their own way -- this is usually the case in my classes, because I always frame the class as a 'pool of knowledge' rather than a teacher/student pyramid. So we pooled our experience, discussed things equally, and as much as they listened to me, I listened to them and we all learned. 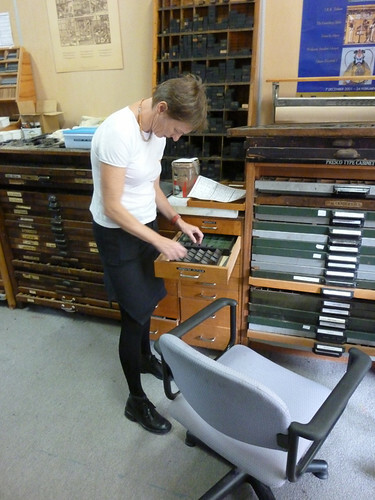 At the beginning of the week we were told about the last Melbourne summer school on 2010 (they are on every year, but they alternate between NZ and Australia) when Carolyn Fraser of Girlprinter and Idlewild Press fame taught the letterpress component. The class set a complete short story as a book, and one of the participants, the equally famous wood-engraver Rosalind Atkins, carved a block for them, and they had so much to do that by the time the end-of-school reception was held on the Friday evening, the class turned up an hour late, hot and sweaty, clutching one still-damp copy of the book to show the rest of the RBSS. We all laughed at this admiringly, and joked that if we finished on time, we should go to the pub and still turn up an hour late, pretending to be stressed and clutching our wet prints. 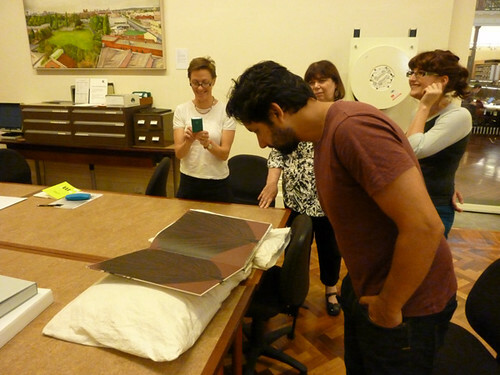 So imagine our shock to find at the end of Friday that even though we'd finished, and we'd pretty much cleaned up, that we were still collating and folding a 'belly-band' for the folio at 6:15pm! 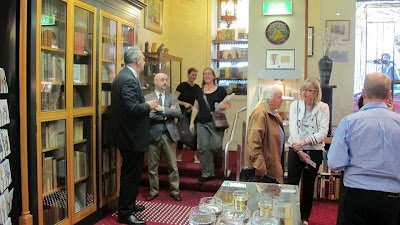 The reception was to be at Kay Craddock's antiquarian bookshop in Collins Street, and we were at least half an hour away by train and foot at the Monash Caulfield campus. Our programme said that it started at 6.30, but someone mentioned that they'd heard it was starting at 6pm! Eek! We gathered ourselves and our wet prints, ran for the train, charged up Swanston Street and into Collins Street, and rushed, hot and sweaty, into the cool elegant bookshop where everyone was swanning around in a clean we've-been-looking-at-rare-books-with-academics-o-wot-fun sort of way, clutching our folio of brand new wet prints. Only to find that no-one believed we'd come straight from the studio and instead they made jokes about coming from the pub! GAH. Serves us right for being cocky, eh? There are lots more photos here at flickr, and I'm hoping the others will upload their photos too. Many, many thanks to everyone who stayed and played, and also to Des Cowley, Librarian and Superhero. It was great fun. PS: Sandy blogged about her RBSS experience too. She not only did my course, but also one before mine on artist's books. What a great two weeks! She's slowly putting together her own letterpress studio, and my small contribution (besides the training) was to spot a gorgeous and clean type cabinet for her in a second-hand shop in Fitzroy on Saturday. She haggled with the owners and now it's hers! Huzzar! Everyone has finished typesetting and this afternoon they have been proofing their formes. I am staying behind a while to set the colophon. The week has passed the hump, and tomorrow we'll all be frantic as we feel the week press in. My eye-bags are getting eye-bags and my brain hurts. But I'm still having fun. We're all learning from each other. Today we were videoed and interviews for the State Library of Victoria's YouTube channel. I will send you the link when they edit our all our 'ummms' and make it look/sound slick. I think that's all I have the energy to write. Yesterday was just the practice day. Today was the Fun Day before the Real Deal. 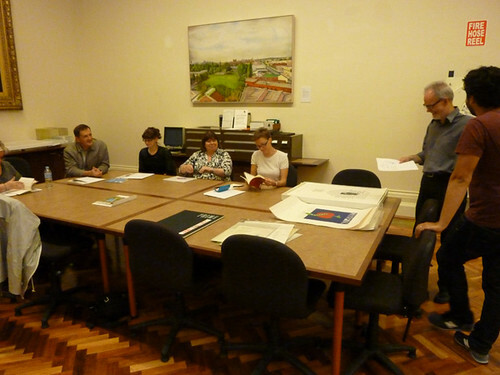 We met up as a class at the State Library and had a chance to introduce ourselves and look at a mouth-watering collection of printed matter pulled out of the collection by the afore-mentioned Des. I've got a lovely bunch of coconuts participants; I have a local book designer, a letterpress printer from NZ, another one from far north Qld, a library professional from SA and an artist/studio tech from WA. Also Trent, who is a book arts teacher and the letterpress tech here at Monash. We came out to the Monash Caulfield campus in a clump on the train after lunch, and spent the afternoon looking at my examples, fondling the equipment, comparing stories and resource contacts and making plans for the week's work. 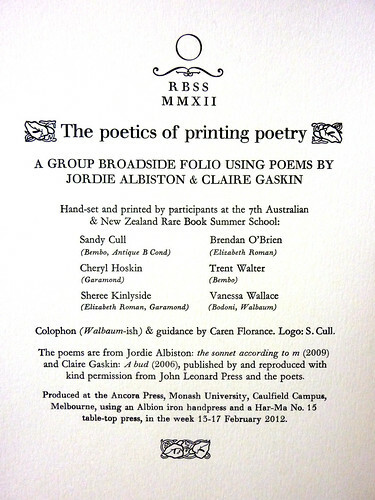 The idea is to print a folio of letterpress poetry broadsides. 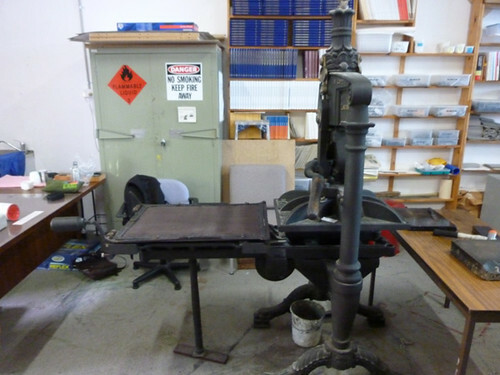 We're going to keep the paper size small to accommodate a few of the press platen sizes, and we're working with a choice of poems by three poets from the John Leonard Press stable. So tomorrow we start, bright and early and earnest, and the dirty work begins! Hello from rainy Melbourne! It always seems to rain torrents for at least one day of every visit to this city, and today's the day. 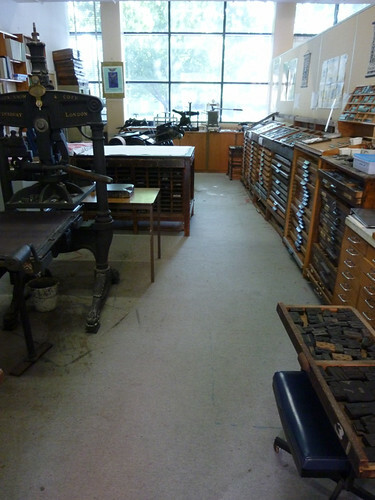 I'm here for the week, to teach a letterpress masterclass at the State Library of Victoria's 2012 Rare Book Summer School. As I write this I'm sitting in the Ancora Press room at the Monash Caulfield campus, learning to wrangle the beasts they house here. I've spent the day playing with their Albion iron hand press and their 'Har-Ma' tabletop press, so that I don't look like a clueless idiot in front of the class tomorrow. I don't mind actually being a clueless idiot, I just don't want to waste their precious learning time doing all the dicking around I've done today, like working out the feel of the handle action on the Albion so it doesn't judder the print, and how to adjust the packing and the platen so I can get a decent print out of the wood type. I arrived yesterday, and after dumping my heavy bags with SLV Rare Books Librarian and all-round good guy Des Cowley, I took the chance to duck down to the art gallery and catch The Mad Square and fall in love with Otto Dix all over again, especially after I saw a photo of him. Woof! Then I had a wander around before meeting up with Des again and heading out to my digs, a library-flat owned by another of the RBSS lecturers. He lives across the road, and the flat is his book overflow repository. It's amazing. No tv, no computer, just books and a good bed & bathroom and basic kitchen, with the bathroom being the only room not stuffed with books. I haven't spent much time in it, because I went out last night, having dinner with Lucy Tartan and her lovely husband, after which she went home to their gorgeous baby and he and I went on to see The Clouds at The Corner pub. Good time had, went to be way too late and now I'm a bit tired. So off I go, into the rain to get to the Sticky zine fair at the Town Hall and then to the SLV for a RBSS launch, and then I might have a very early night before class tomorrow. Hopefully next time I'll have some photos. A friend travelling for a year in South America has just sent me the best link to a black cat story. Look at it and weep with love. Yesterday I roused myself out of my summer stupor and went to the final day of the temporary roller-skating rink in Garema Place. It was a fancy-looking thing, all orange and blue, and had an amoebic shape, with a little curved ramp at one end like a skatepark. I took my faithful old skates for the outing, but they proved to have the wrong wheels on them, too slippery for the lino-like surface. After a big straight-down-on-my-bottom fall, I decided to use the hired skates, and their grip was *much* better. Only one more fall, onto my right hip, after attempting the skatepark ramp (stoopid ramp), but when I stuck to the 'flat' (I use that term lightly, there were lots of little bumps & ripples in the surface) I managed ok. I also met a nice woman and her daughter who seemed like fun people to talk to while I rolled around (Bumblebee came with me but chickened out, preferring to sit by the side & play iPod games). Turned out she's a cake decorator who makes some pretty snazzy cakes. One more week at home and then the frenzy starts. Next week I'm in Melbourne, teaching at the 2012 Rare Book Summer School, and I get home with one day to rest before starting the semester at the art school, only one (hopefully two, if my typography course runs, but it's looking dormant this time around) days a week, but it does mean I have to focus on the days I have for my studio rather than lolloping around like I am right now. 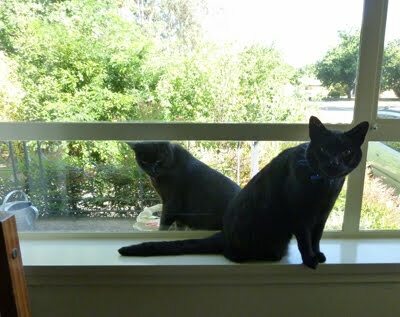 I'll leave you with my black cats, sharing the window. I've never really understood the nostalgia movement that is prevalent at the moment among the Babyboomers and -- increasingly -- Gen X. I mean, if you're nostalgic for the music, surely you just listen to the recordings, which were made in the time you're nostalgic for? Why on earth would you want to pay money to see a congealed lump of wrinklies attempting to be as hip as they used to be? I ate my words last night when I went to see The Lighthouse Keepers at the charmingly shabby Canberra Polish Club. Admittedly, this was a special thing, in that they have only reformed for three or so concerts, and that's it. They were always a pretty laid-back no-fuss kind of outfit, so you knew that they wouldn't really be attempting to reclaim their youth or anything shonky like that. No, it was friends getting together for a long-overdue play, and if mistakes were made during the playing, then they had a laugh, we had a laugh, and a VERY good time was had by all. Of course, the shock is not so much at the way the band looks, but at how the other audience members -- your peers -- have aged. We (a bunch of ukulele friends) first sat up on the stage (next to a big table of the band's parents, who have probably earned every white hair on their heads) and looked down at the incoming punters. A bad angle, considering all the receding hairlines and low-tide dyelines. Lots of nonchalance, real or otherwise, and the chairs around the edge multiplied until it looked as though there would never be any space to dance. I was a horizontal recruit to the band, an awful term, I know, but so true of so many of my favorite things - what is it about the advice of lovers that sticks harder than that of friends or family? 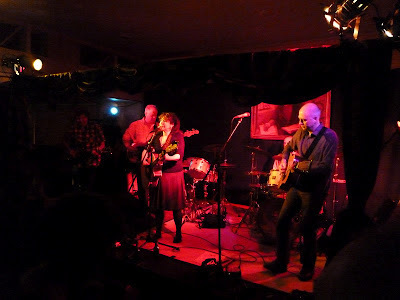 Anyhoo, I was a latecomer to LHK, who were on the verge of splitting when I first listened to them, so I kept a casual eye on what happened next, bands like The Widdershins, The Honeys and a fun little side project called Blumenintahls (if you're reading, Blue, it's 'Metal Goddess' I love playing). So I was really happy last night when 'March of the Green Men' was played mid-set. It's a Widdershins song, but was reworked into a King Curly song (LHK's Greg Appel is older brother to KC's Steve Appel) for the album 'Doomsday Piano'. 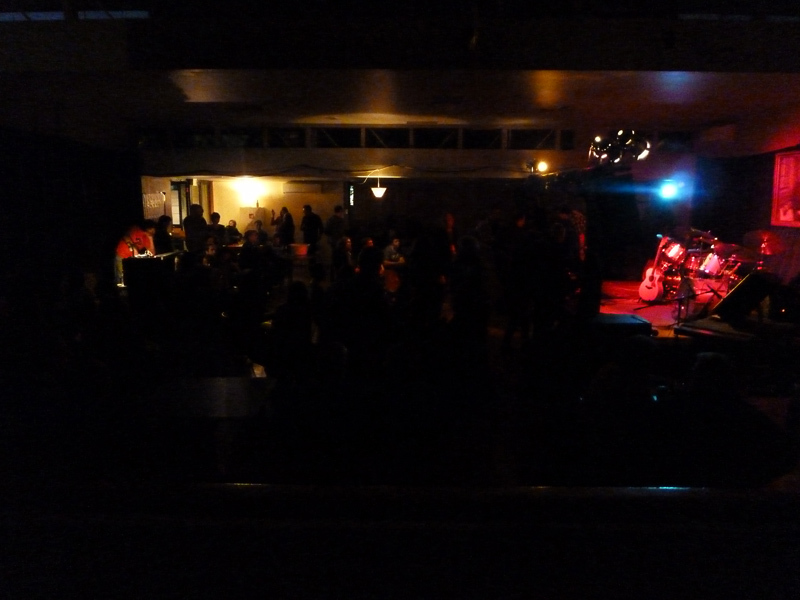 The band played three small to medium sets, as they have never had a huge repertoire. But every song was good, and every song held up to the scrutiny of time. They may have been low-key and laidback, but they were high-class musicians working with quality lyrics, all about relationships, happiness and pain. They've got the pop-jangle of The Smiths (and they played a Smiths cover to cement the connection) without the whine of Morrisey (yet Juliet's singing is definitely more sour than sweet) with a gorgeous mix of guitars, including slide guitar and harmonica, so they had a lovely country edge to the pop. Great song, although I prefer many of the others, like 'Springtime', 'Ocean Liner', 'Bad Mood' (my shower song) and 'The Beat (Hey I want my loving back)', which was played right at the end, right when I thought they'd forgotten it, and played it with two drum kits, so it went straight through my body. I danced behind the curtains up on the stage with Lynda (who being ten years younger than I had missed the original scene, and was wistfully enjoying this incarnation) during the first set, and then moved down onto the floor when everyone got the bug, and danced non-stop for the rest of the night. It was wonderful. They have released an (incomplete) selection of songs on a CD called 'Ode to Nothing', which should be available at your local indy music store (do they still exist where you are? 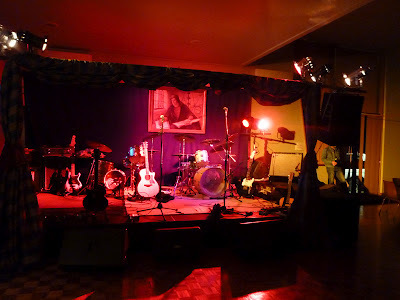 We have one in Canberra, thank Ceiling Cat), and is also downloadable on eMusic, along with another collection, Lip Snipe Groin that has some of the same but also some of the ones they left out. Apparently they're playing in Sydney tonight, so if you like what you read and you can get to their show, here's the details. I felt twenty years younger dancing to them last night while I ingested a couple of litres of cider, and I feel twenty years older today as a consequence, so perhaps I've just balanced out, and the experience has left me exactly where I should be, only happier. Especially for Colonel Duck. And Aunty Lou. 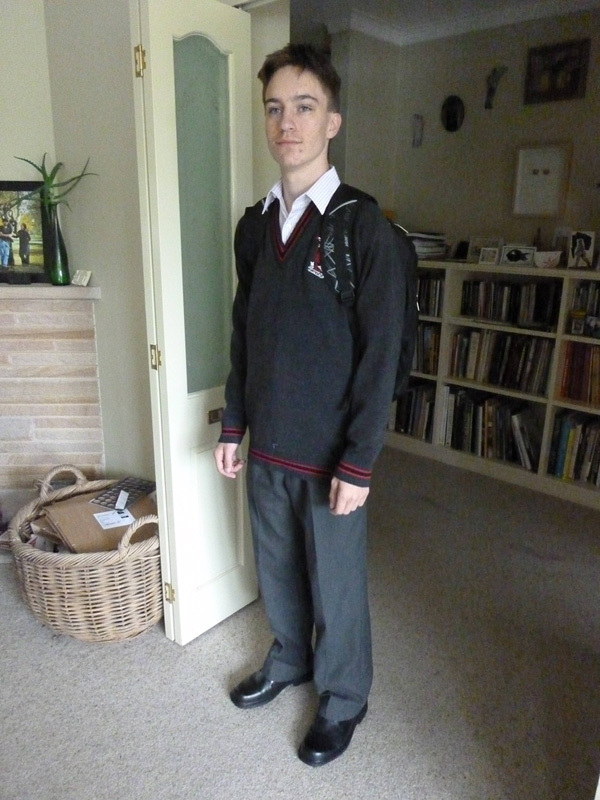 PS: here's him ready to dash to school, late already on the first day! Bloody rain, tuh. PPS Also note the JUMPER! It's wet and freezing, we're all in jumpers and it's FEBRUARY.